As I walked down the dirt path, I heard someone shout. 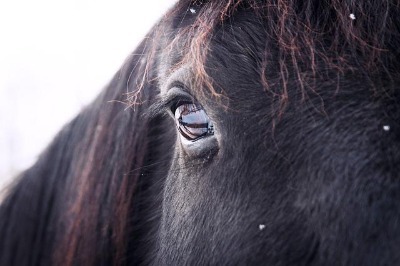 I turned around and like a flash of lightning, a black horse ran in front of me. "Woah!" I said as I stumbled back and landed on my bottom. "You okay?" Someone asked from behind. I stood up and turned around. The first thing I noticed was his eyes, they were warm and filled with life. His hair was ear length and blacker than the blackest night. "I'm fine." I said brushing the dirt off my jeans. "That's good. I'm Travis, by the way." He said shaking my hand. I admit it. I was attracted to him. "Hi Travis, I'm Jillian. Was that your horse? "I asked him. "Yeah, that's my horse." He said sadly. We heard a faint whinny. "I better go catch him. See you around?" He asked. I nodded. He then smiled and ran off. What was that about? I sighed,shook my head and continued down the road. About a mile down the road was a small riding academy called Hearts and Hooves. I went into the stable and went to the fourth stall on the right. Waiting for me there was me black patched paint mare named Estella. I had bought her from a man at a slaughterhouse when she was just a yearling. We really did have a special bond.We could communicate with each other without words or a whip. I went in her stall and brushed her down before tacking her up. I mounted her and went to trail b.
I don't know why, but I kept hearing hoof beats that weren't Stella's. I'm probably just hearing things, I told myself. I heard a faint whinny. "Stella, you hear that?" I asked her. She tried to turn around, but I kept nudging her forward. She knew something was there, something unseen, something unheard. "It's okay girl, it's okay." I said, trying to comfort her, but it didn't work. I knew we were getting closer and closer, and closer. Suddenly, a big, black stallion stopped in front of us and reared. I fell of of Stella and and hit my head on a rock. I only put 4stars because it is very unfinished put some more in there. You definitely caught my interest! Hope you write another installment. :) When you do please publish it as a comment here so we can keep it all together.